Volvo has launched the hatchback version of the V40 Cross Country, the V40, in a price bracket of Rs. 24.75 lacs to 27.70 lacs (Ex-showroom Delhi). Despite Volvo lacks a strong dealership network in India it’s cars are doing pretty well. With the launch of V40, the Swedish carmaker has jumped in the luxury hatchback category that includes cars like Mercedes A-Class and BMW 1-Series. 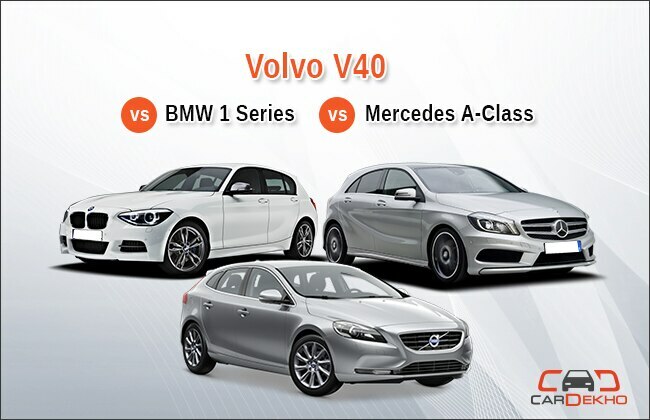 Let's take a look on how V40 takes on its competition. There is no doubt in the fact that Volvo makes gorgeous looking cars and the V40 is no exception. The flowing layer of metal is evident in every corner, starting from the front that gets wide and low stance while the sides features a graceful beltline that ends up in the boot. A optional sports package is offered that makes the exteriors look even better. Speaking of the BMW and Mercedes, 1-Series gets great character lines and that signature BMW kidney grill but it isn’t something fresh as the Volvo while Mercedes A-Class too gets a good flair of surfaces but still not as exclusive as the Volvo. The insides too are very luxurious and are loaded with features like TFT display, Keyless drive, Panoramic Sunroof, Rain Sensors, Park Assist Pilot, R-design package on the inside along with leather upholstery. On the other hand, 1-Series and A-Class offer similar features like infotainment system and leather upholstery. Out of the three Mercedes Cabin looks the best with its propeller type A/C louvers and paneling which is pretty much simple in The V40. Volvo excels in terms of the motor that comes packed with class-leading performance figures. The 2.0 liter inline 4-cylinder motor produces 147.5 bhp that surpasses BMW’s and Merc’s 136 bhp. The torque produced by this Volvo is 350 Nm that will ensure pick-up on tap, hence ensuring hassle free overtaking. Though, the 6-Speed automatic could be considered a tad conventional in front of the 1-Series’ 8-Speed Steptronic and A-Class’ 7-Speed DCT.